Is there any affordable housing being built in Phoenix? 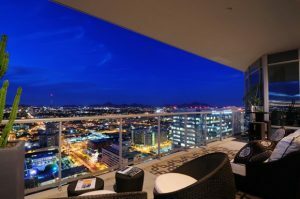 It seems every new apartment or condo development rising up in downtown Phoenix is considered “luxury.” Developers are racing to buy up infill properties and cover them with high-end housing that brings high-end rent. Is there any affordable housing being built in Phoenix? The answer is yes, but not much and not enough. The average rent for a one-bedroom apartment in downtown Phoenix now costs more than your average mortgage payment— $1,600. We have seen this before: an area in decline, suddenly becomes the next big thing. New development breathes in new life and investments—and of course, higher rents and home prices. Long-time residents of the downtown area, often minorities, find themselves displaced—pushed out by the turn of fortunes. Economic revival often makes affordable housing is one of its first casualties. The City of Phoenix has created the Section 32 Home Ownership Program to provide affordable housing near the city’s downtown and beyond. The most current project is an infill development in the Garfield area east of downtown. Trellis, a non-profit, is working with the city to get ten or more homes constructed on property Phoenix acquired during the economic crash. The city took custody of many distressed properties during that time and has rehabbed them over the years. Now, some of those properties are providing an avenue to lower income residents looking to buy their first home. Section 32 offers subsidies to first-time homebuyers who are at or below 80 percent of the Area Median Income (AMI), and will use the home as their primary residence. Eligible buyers purchase the home for market value. Through a combination of grants and subsidies they receive a 20% discount off the appraisal value, help with down payment and closing costs and a one-year home warranty. Section 32 requires potential participants, based on their credit score, to take homeownership, financial fitness and hands-on maintenance classes. Properties eligible to be sold under Section 32, don’t have to be city-owned or on city-owned property, but they do have to pass a Housing Quality Standards Inspection. In the Edison- Eastlake neighborhood, near 16th street and Van Buren, the city plans to develop affordable housing. Phoenix has received a $30 million federal grant from the U.S. Department of Housing to redevelop the area. The project will redevelop nearly 600 outdated public housing units and several vacant lots. The City is also encouraging developers to include a percentage of affordable or workforce housing in its projects by offering perks such as tax breaks or extra height. While there are housing units for very low-income people, the real gap is in housing for the workforce. These are middle income individuals, making between 35 and 50-thousand dollars a year. They don’t qualify for low-income housing, but they can’t afford the rents of these new luxury apartments any more than their lower income peers can. Section 32 will help some of these workforce earners gain home ownership, but there is a long way to go to fill this gap– and many more people in this predicament than available homes. At Landmark title, we work with developers, builders and realtors and have the expertise to handle even the most complicated real estate transactions—for both commercial and residential properties.. For more information, visit our website or call (602)748-2800.